Looking down at the James Webb Space Telescope, the sunshield, which is stretched out underneath the mirrors (yellow) looks like a spider web. Click image to enlarge. Giant-sizedtelescopes such as Hubble, Spitzer and Chandra offer unprecedented views of thecosmos, but astronomers are eager to put more powerful tools into orbit around theEarth. Without theextra help, said Rachel Somerville, an astronomer at the Max Planck Institutefor Astronomy in Germany, it may be impossible to resolve some of theuniverse's greatestmysteries. "Weneed better observations to make our models better," Somerville said,noting her search to understand galaxy formation and mysterious quasars. "? If you just put theorists in a roomfor the next 15 years with the biggest supercomputer you can find, it willnever happen." NASAexpects the James Webb Space Telescope (JWST) to launch in 2013, and many scientistsare already pondering their future observations of tiny extrasolar planets,elusive black holes and distant galactic arms. Somervilleand other astronomers laid bare their sky-watching hopes—including telescopesbeyond JWST—at the recent Astrophysics 2020 conference, sponsored by Johns Hopkins University and held at the Space Telescope Science Institute in Baltimore. JWST willboast asegmented mirror nearly 21 feet (6.4 meters) in diameter, which has seventimes the light-collecting area of Hubble. Somerville thinks the sensitive infrared observatory will be crucial forunderstanding galaxy formation. "If you don't have a high enoughresolution, galaxies you're trying to observe are going look like fuzzyblobs," Somerville said. "Seeing the star-filled arms of galaxies indetail, for example, can tell us how some galaxies evolved." And thehigher the resolution, the further a telescope can see back intime, as light can take millions or billions of years to reach Earth. While Somerville said NASA's next "great observatory" will deliver unprecedented viewsof galactic arms, she thinks the telescope could use some help to speed alongother cosmic discoveries. "JWSThas a big mirror and is very sensitive, but it has a postage-stamp sized camerasensor. You can see very, very deep into the universe, but you can only seethis much at a time," she told SPACE.com, drawing the sensor sizein the air with her hands. "Thattakes a long time. If you have a smaller-diameter telescope with a lot ofsensors, you can see much more of the sky at one time." Sheexplained that while such "wide-field" telescopes would not be as sensitiveas JWST, such high-sensitivity telescopes could step in to observeinteresting areas in greater detail. "It narrows your playing field and,ultimately, saves you a lot of time," Somerville said. Saving thattime should help astronomers find objects of interest faster and rapidly expandscientific knowledge. Somerville, however, isn't the only one withbig ideas. Wes Traub, an astronomer and project scientist for several proposedplanet-finding NASA missions, would like to see extrasolarplanets in greater detail than ever before. Traub andhis colleagues envision blocking out the blinding light of distant stars withgiant occulters, or "solar shades," to observe planets around starswith future space telescopes. "Thereare many, many planets to be found," Traub said. If the solar shade ideatakes off, he explained, astronomers could block the intense glare of aplanet's star and precisely measure light reflecting off the planet. In effect,astronomers could look for life-nurturing compounds such as water, methane andoxygen on the planet. "If wecan image a planet with just one pixel on a detector ? we could characterizeits surface and search for life," he said. 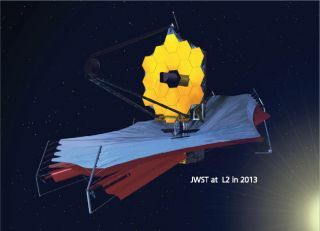 If NASA approves such a missionin the next decade, JWST may be the first telescope to take such measurements. But Traubsaid he would like to see bigger space telescopes to peer at distant planets. "Whenyou go to a larger telescope, you gain proportionately that much detectionability and sensitivity," he said, which allows for speedier extrasolarplanet searches and observations. "It would be lovely to have a 16-meter[53-foot] diameter telescope to do this."